Hall of the Mountain King: Review: Holy Grail, "Crisis in Utopia"
With White Wizzard’s Over the Top being my favorite record of the year, I couldn’t help but look forward to the debut release from Holy Grail, Crisis in Utopia. What you have here is a band made up partially of former members of White Wizzard who moved on with a new name after an ugly split. While it likely wasn’t pleasant for those involved, the good news for music fans is that we got two damned solid traditional metal outfits out of it. The basic genre is the same, but Holy Grail takes a slightly different approach. 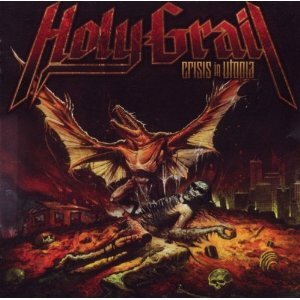 While White Wizzard revels in the camp of a pure throwback sound, Holy Grail puts a more modern spin on it, bringing elements of power metal and even thrash to bear in the tracks on this record. It’s taken me a while to get around to reviewing this because I had to listen to a song other than “Call of Valhalla,” my personal favorite of the songs on Crisis in Utopia. 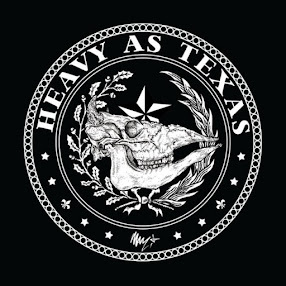 It opens with a massive throwback traditional metal riff with just a hint of doomer or stoner rock in the melody and a huge chorus that gets stuck in your head. That’s far from the only highlight on an album loaded with great, memorable metal. The lead guitar licks that open the record on “My Last Attack” will catch the attention of trad fans instantly. “Immortal Man” offers up a chunk of great galloping traditional metal straight out of the early 1980s. “The Blackest Night,” another favorite, has a great groove and brings some more modern influences in on the screaming, chugging chorus. There’s a bit of an Iced Earth feel to the song overall. “Chase the Wind” showcases more top-notch guitar work from Eli Santana and James J. LaRue, and another one of those huge, catchy choruses. “Requiem” delivers a sludgy, satisfying Sabbath-influenced opening riff before settling into more familiar territory, and “Cherish Disdain” opens with a charging thrash riff. In terms of pure musicianship, Holy Grail probably holds the edge on White Wizzard by virtue of the dual guitar attack of Santana and LaRue, who wail impressively all over this record. The sound all around on Crisis in Utopia is locked in, focused and tight. I recall not caring much for James Paul Luna’s vocals on White Wizzard’s High Speed GTO, but I really like them on this record. Maybe it’s the fact that they’re a little more fitting for this style than the pure Iron Maiden throwback of that EP. They’re solid and, at times, quite impressive. I really like the nostalgia factor of White Wizzard, and I’ve had considerably more time with that record, so it still has the edge in my mind. But for those who didn’t care for the camp of Over the Top, Crisis in Utopia might be more to your taste. Regardless, if you like well-played, memorable traditional metal, you should check it out. A review copy of this record was provided by the label.